MOBILE, Ala. – Austal officials joined ship sponsor U.S. 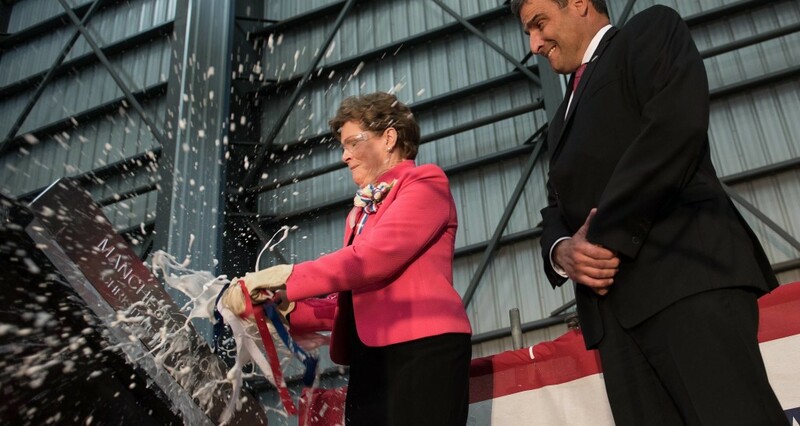 Senator Jeanne Shaheen and many distinguished guests in celebrating the christening of the nation’s 14th littoral combat ship (LCS), the future USS Manchester, here Saturday, May 7, 2016. Manchester (LCS 14) is the fifth LCS in Austal’s 11-ship, contract worth over $3.5 billion. With its shallow draft of 14 feet, the Austal-built Independence-variant LCS is an advanced high-speed and agile 419-foot aluminium trimaran combat ship that combines superior seakeeping, endurance and speed with the volume and payload capacity needed to support emerging missions. Shaheen, the only woman in U.S. history to be elected both a Governor and a United States Senator, has served in the Senate since 2009. She has been committed to serving the citizens of New Hampshire for decades and is known for her common-sense leadership, hard work and dedication to improving the lives of the middle class As New Hampshire’s Governor, Shaheen helped create nearly 67,000 new jobs while keeping New Hampshire’s tax burden the lowest in the country. She and her husband, Bill – a New Hampshire native – live in Madbury and have three daughters, Stefany, Stacey and Molly (Matron of Honor), and seven grandchildren. Traditionally, the christening of a ship is where the ship’s sponsor blesses the ship by breaking the bottle of champagne on the bow of the ship and ceremonially gives the ship its name. The roll of sponsorship represents a lifelong relationship with the ship and her crew. The future USS Manchester (LCS 14), will launch in mid-May and is scheduled for delivery in 2017. She has a maximum speed of more than 40 knots, a voluminous 28,000 sf mission bay, and a flight deck capable of simultaneously holding two H-60 helicopters. Austal’s LCS program is in full swing with three ships delivered and seven ships under construction at this time. Montgomery (LCS 8) conducted acceptance trials late last week. Gabrielle Giffords (LCS 10) and Omaha (LCS 12) are preparing for trials. Final assembly is well underway on Tulsa (LCS 16) and modules for Charleston (LCS 18) andCincinnati (LCS 20) are under construction in Austal’s Module Manufacturing Facility. The company has also been contracted by the U.S. Navy to build 10 Expeditionary Fast Transports (EPF). Of the 10 ships included in the $1.6 billion block-buy contract, six have been delivered. This entry was posted in Christenings and tagged christenings, uss manchester. Bookmark the permalink.